Enjoy a spectacular evening in Saxe Point Park and watch the Greater Victoria Shakespeare Festival presents MACBETH. 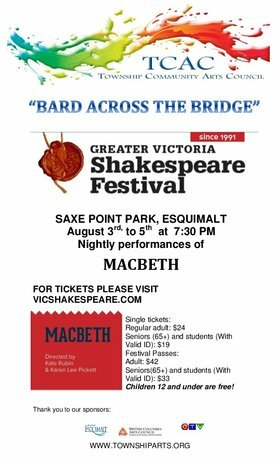 Don't miss the chance to watch Shakespeare's tragedy about political ambition right here in Esquimalt. AUGUST 3,4 and 5 at 7:30pm.